The History of Bottled Water | The Water Depot, Inc. The History of Bottled Water | The Water Depot, Inc.
Water is an essential component for life. We can’t live without it. Our adult bodies contain roughly 60 % of it. Although it has become a common fixture in our lives (as well as our grocery carts, gym bags, and travel packs), bottled water was not always so easy to find. So how did the practice of bottling H2O start? Natural water has always held special curative and healing properties, and these were recognized by people from Europe and Rome as divine water. Some natural water sites were used as religious locations of worship, and archaeologists have discovered offerings thrown into natural pools and springs. However, it was the Romans who first used natural water for drinking and bathing. They set up baths, and these places were used for medicinal purposes. Back then, water was not always safe to drink, and was usually contaminated with toxins, water-borne bacteria and pollution. In order to continue benefitting from the natural waters, some visitors (particularly the wealthy ones) decided to take some of the water home with them in various containers. Bottled water formally became a product in Europe in the 15th and 16th centuries. England started bottling and selling its mineral spring water as early as 1622. People had been gathering and transporting water from springs and wells for years before, but they were among the first bottlers to do so on a large-scale, commercial level. Other locations; such as France, Switzerland, Belgium, Italy, and Germany, also began commercializing their waters for the consumer market. By the 19th and 20th centuries, bottled water was being sold in pharmacies, and the water that used to be enjoyed only by the rich was now becoming available to everyone. In America, the water coming from taps during those days was known to be less than ideal. Chlorination made water much safer, and the Safe Drinking Water Act sought to standardize the water quality all over the country. Water started becoming cleaner and safer to drink from the tap by the 20th century. At the same time, European companies invaded the US market; targeting America’s rich and trendy. The modern bottled water industry had finally arrived, and soon; American bottled water brands entered the picture. Today, bottled water is a healthy and convenient alternative to sodas and other sweetened beverages. It is found virtually everywhere, and is available in a variety of packaging formats. At The Water Depot, we have made it our business to provide water with a personalized touch for our clients. Our bottles of Purified Water and Award-winning Natural Spring Water follow strict EPA standards to ensure their safety, and our bottles, labels, and caps are made from 100% BPA-Free and 100% Recyclable high-quality plastic. We have also begun introducing rPET bottles, which are made from plastic that has been recycled and is totally eco-friendly. What’s more, we can customize and personalize your label so that you can promote and advertise your company or product on our water bottles. 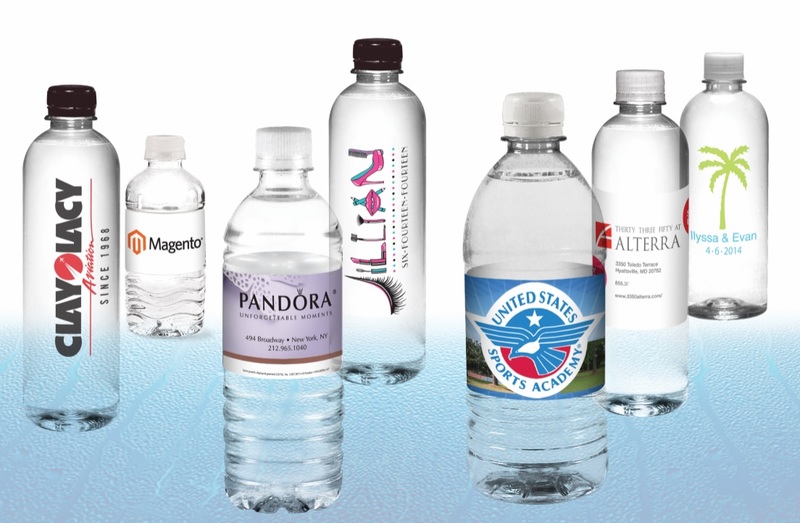 Contact us or call us Toll-free at 1-866-903-2505 to get your custom label bottled water quote today!